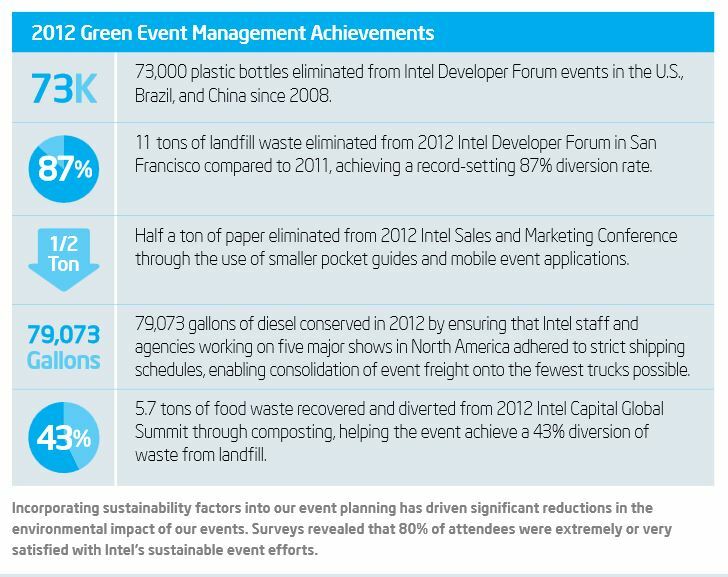 Reporting about sustainable events grew up a little this month as Intel and Autodesk joined Oracle in disclosing information about sustainable event strategies in their annual corporate responsibility reports. This is an important step beyond reporting singular case studies for individual events and meetings, which until now have dominated the sustainable event reporting space. Now companies are looking across the activities of their entire event and business travel departments, and the supply chains managed within, to see what contributions are being made to the company as a whole, and its shareholders. This positions event reporting as a more integrated part of communicating corporate responsibility and business success. An important evolution for event planners to be aware of, given the significant progress against carbon reduction targets that can be made by focusing a lens on business travel and meetings. Just ask Autodesk, who upon reporting 34% of company carbon emissions resulted from travel, successfully reduced emissions from this source by 12% within the last year. Will these examples lead to other companies seeking information about how business events are contributing to company sustainability goals? Time will tell. In the meantime, how are you preparing? Hi Guy. I’m not sure about Autodesk. In the case of Intel their sustainable event program is a management system that operates across multiple events the enterprise is involved with. So reporting is not “anchored” in the way you might traditionally see where a major report is released for a showcase event. Because of this approach it has made sense for them to use reporting resources for events in an integrated way with their annual company corporate report which can be seen at the links provided.